If you’ve visited a craft beer shop recently, you’re aware of the incredible variety of beverages available for you to enjoy with your meals. 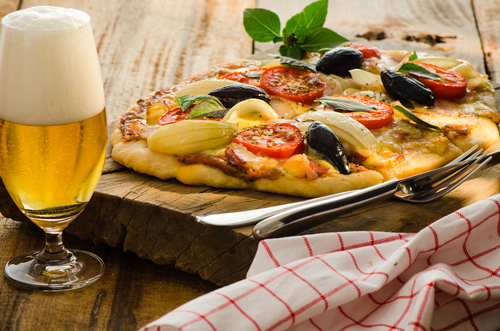 Selecting specialty beer to accompany your recipes can significantly enhance their flavor. Instead of feeling overwhelmed by your options, take a few moments to familiarize yourself with some simple guidelines for pairing beer with food. A fun and simple way to enhance your next celebratory dinner is to choose your beverages according to the season. For example, medium bodied ales go well with the burgers and wings served when watching football on crisp, fall days. Christmas brews pair well with the hearty meals enjoyed during the holiday festivities. Light, citrus-flavored drinks carried by a craft beer shop match the zest of summer recipes like fruit salad or zesty tacos. The different ingredients you use in your meal prep can be highlighted by certain specialty beer. Fruit beers are a delicious complement to chicken or pork. A stout can deepen the flavor of a juicy steak while a pilsner is a tasty match for grilled fish. If you tell them about your recipe, the experts at craft beer shops can easily help you determine which drink is best. In addition to the basic ingredients used in a dish, subtle spices also provide inspiration for beer pairings. The smoky flavor of barbecue seasoning is mirrored by a bold porter. Herbs like coriander and thyme can be found in most Belgian wheat. The next time you’re planning to try a new and inventive recipe, remember that a craft beer shop can provide the secret to making it a meal to remember. Rabun ABC Package Store is Clayton, Georgia’s favorite place for specialty beers, wine, and spirits. The liquor store can help you choose the best pairing for your next meal. To learn more about their selections, call (706) 782-6937 or visit them online.